Lots of fans were suprised by last years “If I Can Dream” release, already considered to be one of the best STAR releases ever, mainly because the new inventive approach they did on lots of the tracks, making them more “alive” then ever. The STAR team was overloaded this year with request of doing this follow up, and now it is ready to blow you away! Presented in glorious “Black and White” to obtain the same “feel” as the first edition. Again some “split screen” clips are used for a more “story telling” experience. Again, highlights are hard to pick, since all tracks are very fitting and stand on there own. Elvis is on his way, THATS whats happening! Incredible scenes “help” Elvis to get on stage, and bursting into this rocking song, footage of both Elvis and the Orchestra are included. Nice little clip of this 1957 song, Elvis was 22 when he recorded this, (sorry Cilla) and did a nice rehearsal version in 1970, which is used here, along with some “funny” moment of the same period. What a great opening was included on this track.... sounds familar doesn’t it..? The STAR team took this to the next level, and used that actual footage, to make an outstanding modern clip. Elvis can’t get this girl out of his head, he has “A thing” for “Judy Tyler”... great clip, including trumpets ...watch the moves! Very unusual version this time, different angles and rehearsal footage used here, some not from the actual song, but it al works out just fine. When seeing this you can’t help but thinking it is almost new footage presented. Hoping “This time the girl is gonna stay” we see nice pics of Linda and Elvis, this song fits the footage very well, including rare live performances, and even some backstage. Like “The Wonder of You” this really is about Elvis and his fans, showing rare footage and cool edits, of the love from our man to us and back. “Each time we meet love, i find complete love” wherever he goes, there are fans, whenever fans visit his houses, there is Elvis... NOW AND FOREVER.. LET IT BE ELVIS!! 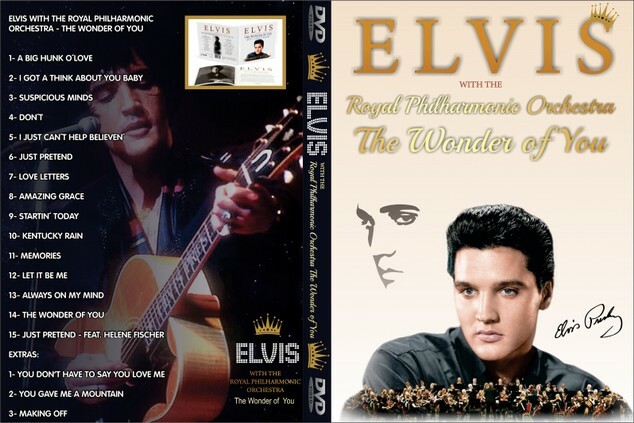 DELUXE Box-Set of 'The Wonder Of You: Elvis Presley With The Royal Philharmonic Orchestra', that includes a special 17 track CD.